My name is Raquel! I'm a 25-year old, experienced solo traveller looking for an opportunity to either work for pay or accommodations anywhere in the world. I'm natively from Chicago, Illinois, USA. 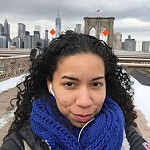 My most recent travel was to Brooklyn, New York, USA where I stayed for about two months, living only in hostels, sharing meals and laughs with folks from all over the world! Hands-down, it was one of the greatest experiences of my life. Previous travels have also been to Toronto, Ontario, Canada & Jutiapa, Guatemala. I have 2+ years of experience in hospitality and customer service, coming from work done in a popular, high-volume deep-dish restaurant in Chicago (mmm, deep dish.) I worked as a server, assistant manager, cashier and phone worker - a little bit of everything. I am fluent in both English and Spanish, partly in French and currently practising Portuguese.